The word kosher means proper or acceptable, and it has informally entered the English language with that meaning. But kosher laws have their origin in the Bible, and are detailed in the Talmud and the other codes of Jewish traditions. They have been applied through the centuries to ever-changing situations, and these rulings, both ancient and modern, govern OU kosher certification. The Bible lists the basic categories of food items which are not kosher. These include certain animals, fowl and fish (such as pork and rabbit, eagle and owl, catfish and sturgeon), most insects, and any shellfish or reptile. In addition, kosher species of meat and fowl must be slaughtered in a prescribed manner, and meat and dairy products may not be manufactured or consumed together. Why do so many foods require kosher supervision? For example, shouldn’t cereals and potato chips be inherently kosher since they are not made from meat, fowl, fish or insects? The answer is that all units and subunits in a food item must be kosher as well. Thus, for example, a cereal may be non-kosher because it has raisins which are coated with a non-kosher, animal-based glycerin. Potato chips can be non-kosher if the vegetable oil used in the fryer has been refined and deodorized on equipment used for tallow production. In fact, equipment used for hot production of non-kosher products may not be used for kosher production without kosherization (a hot purging procedure). Interested in learning more? 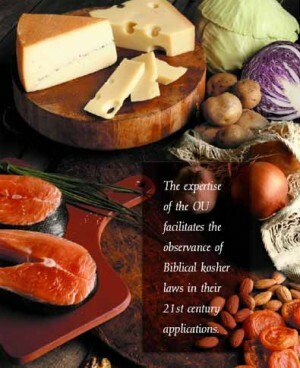 See our Kosher Primer.